If you have been reading for any time, you know that I shared this post three years ago, the connected piece was shared the three previous. I took a break, not wanting to bombard. But the truth is, we all feel the weight of this day, some of us more acutely. I mourn for my friend, with friends, with strangers today. And I, and so many who loved him, honor the life Jason lived today, and every day. We honor the heroes. We honor those who continue to protect. And I am grateful for God’s gift of a dear friend who made everyone who knew him want to be a better person. 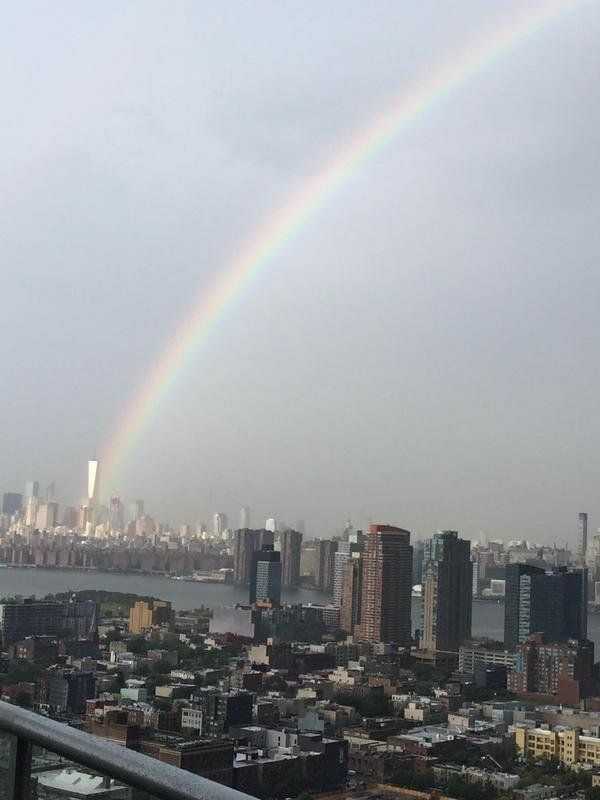 A rainbow appeared over Manhattan yesterday. The headline that circulated noted that it was the eve of the 14th anniversary, adding to the wonder and sentiment. Between reminders to floss and the last-minute comedy routines, I found myself wondering, what was he doing fourteen years ago tonight? Was it like any other Monday or did he discover a great restaurant on his way home? Did he finish a book or begin one? Did he go for a run? Did he see a rainbow? And in the morning, did he hesitate? Did he stop for coffee? What if the line had been longer? Did he know how much he was loved? I thought of my friend’s husband. He lost his father in WTC. I thought of the life he has built, the way he has honored his father, his beautiful family. If his father could see what he has accomplished, in response to and despite the loss, what a gift it would be for both of them. I thought of our lives before that day. The freedom we took for granted, the security. How we can mark the change as a nation, how those are gifts some have never known. I thought about our choices. The ones we make that lead us to places we never dreamed. The choices that close and open doors. The choices with far-reaching blessings or consequences. And I thought about our responses. Our response as a nation in the days after, our responses now, still raw for so many. The grief doesn’t lose its grip. For me, there are different aspects of grief today. There was a tragedy that impacted thousands and changed our country, difficult enough on its own. There is a deeply personal loss, separate but inextricable. Heart-wrenching details and too many questions. His name, etched in stone, is one of thousands. For those who knew him, one of a kind. On the eve of September 11th, we went to bed, like any other night. No one could have predicted how our lives would change. Choices, unfathomable choices were made. Heroic responses led to heroic loss. And we would never be the same. We will never forget. Each year I share this post written for my dear friend. He lived a life with certainty. He was blessed with a family that loved and supported him. He had an unshakable faith, a drive to live a life of purpose, a heart open and ready to share. I may never know how he spent his last evening, his last moments, but I can say, how he lived his life. He loved well, lived well, and will always be missed. The light here begins to change in September. It softens a bit, reflecting off the leaves. The fauna seems to let out a collective sigh of relief from the harsh Texas summer. And yet, for me, it now comes with a heaviness that wasn’t there eleven years ago. A mixture of grief and gratitude. For most people, September 11th, 2001 was a night where sleep was fitful and hard to come by. On top of the horror that the entire nation experienced, I was awaiting news of a dear friend. 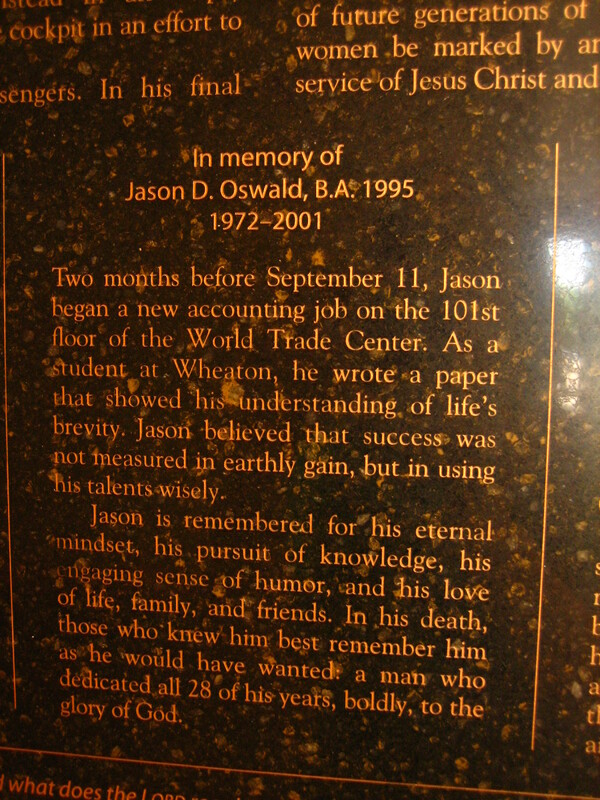 Jason had last been seen that morning, getting on the subway on his way to the North Tower. He had recently begun his job as a Bond Trader at Cantor Fitzgerald. I called his phone repeatedly throughout the day, leaving message after message. Unaware of the location of his new job, I was completely caught off-guard when I got a phone call that evening saying that he was missing. I chose to hope for the best. I knew the chaos the entire city was facing. I chose to believe I would hear his sweet voice again. And I have, but only in my dreams. In one of the few moments of rest that night, Jason came to me in a dream. He kissed me on the cheek and told me he would always look out for me. And I believe, in many ways, he has. I met Jason at Wheaton College but our friendship didn’t really blossom until after I left. At first we connected through letters, and then we found ourselves both living in Austin. Even when he left to begin a career in Chicago, we would fly back and forth to spend time together. Although we were usually in dating relationships with others, we each looked to one another for advice, encouragement, and a safe place to be. Jason had found the perfect balance of listening without judgment, but pointing you to the truth. And when you needed to laugh, he knew just where to insert the under-the-breath comment. He was truly one of the most Christ-like men I have known. His integrity and compassion impacted so many. With his wisdom and wit, he was a steadfast source of comfort for all who were fortunate enough to call him a friend. Grief is a funny thing. It ebbs and flows. At times it is overwhelming, and then you realize that you’re living lighter. And then you almost feel guilty that it is gone, for now. The cliché tells us that time heals wounds. I wouldn’t agree with that statement. Grief has to be tackled and embraced, absorbed and freed. For years, I found myself retreating to mourn in solitude. I didn’t know what to do with the loss I felt. If you are a spouse, a parent, or a child, the gravity of the loss is widely understood. As it should be. But what about dear friends? How do you explain that loss? Did I have the right to still be grieving? Then last year, on the tenth anniversary, I chose to plan the Austin 9/11 Walk to try to bring people of all faiths together and remember. I chose to work and walk for Jason. This past Spring, I returned to his memorial at our college campus and processed with another dear friend. I cried and laughed and mourned. I have found more healing in the “doing” than I was able to in all of the previous years. No one can tell you how and when to grieve. It is a unique path for each of us, but one that must be walked. My birthday fell the weekend before that Tuesday. He always called or sent flowers. He forgot to call. I knew that he had moved to New York to see where things could go with a girl. But for him to forget to call, I knew things must have been getting serious with her. I had to process, “Was I okay with this?” “Of course,” I thought, “If he is happy, that is all I want for him.” I decided that I would give him two days to call, or I was going to give him a hard time. That time never came. This Spring, as I was praying about the grief I still felt, I felt like God was saying to me, “You were willing to give him up before as long as he was happy. He is with me and he is very happy.” There is comfort in that thought. So as September approached this year, I noticed that I felt a little lighter. I noticed that the gratitude for my time with him, and for all he taught me, outweighed the grief of the loss. We all have a choice. To dwell in sadness and fear or to move through it. It is easy to see how Jason became the man he did. In an article published shortly after his death, his mother said, “My choice is to be bitter and angry or to go on and make the world a better place. I know what Jason would tell me.” Thank you, Jason, for making me a better person and the world a better place. #NFLChallenge-Can You Sacrifice 1% this Season?